The new dPDB™ Passive Direct Box features two high-quality direct boxes in one portable enclosure. It is a rock solid, roadworthy DI for connection of the outputs of electronic musical instruments (or other audio sources) to the balanced inputs of mixer consoles and other balanced inputs. It also allows connection of a music source to an instrument amplifier while simultaneously patching it to a mixer. The dPDB™ features switchable Input Attenuation (0 dB, -20dB, -40dB), a 50k Ohm Instrument Input, 50k Ohm Parallel Link jack, a 600 Ohm XLR Output Jack, and a switchable Ground Lift. The ART dPDB™ is a must-have in any audio tool kit. Enclosed in a rugged steel chassis, it is designed and manufactured to the highest standards to provide years of quiet, reliable performance. 1. Electric guitar and bass pick up output signals - The high impedance signal from a guitar or bass guitar pickup is translated by the dPDB™ into a low impedance balanced signal required by mixing consoles. 2. Keyboards and line level signals - The dPDB™ automatically balances and matches the line level outputs of modern electronic keyboards. If you are using a multiple keyboard setup and your keyboards are all plugged into a single instrument amplifier, the dPDB™ can be used to replace individual direct boxes. Simply send the output of the instrument amplifier to the dPDB™ and then to the console (instead of a separate DI box for each keyboard). 3. DJ console output signals - DJ mixers often supply only an unbalanced –10dB signal. 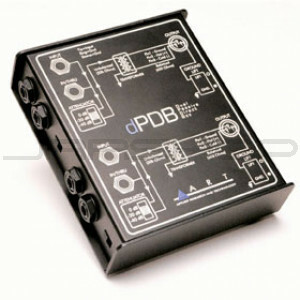 The dPDB™ converts this signal to a balanced line level signal before it reaches the console, while providing a convenient method of connector transition with the capability to run long cables. 4. Speaker level signals - The dPDB’s ability to accept speaker level inputs from a power amplifier’s output allows post-amplifier, post eq and effects signals to be fed directly to the console. In this manner, a particular effect or amplifier sound can be sent directly to the mix.